One of the books I picked up at the book sale was a cookbook. Actually, my aunt picked it up, but when we were back at her place looking through our purchases, I flipped through it and fell in love with half of the recipes, so she told me to take it home. Thank you, Auntie! You’ll get it back someday, I promise! I tried a side dish out of the book tonight, but as usual I didn’t like half of the ingredients so I adjusted everything and made it different. Here’s what I ended up with. Cook the onion and garlic in oil until the onions are soft and golden. You can use a frying pan but I used my flat Le Creuset dutch oven because the whole thing goes into the oven afterwards. Stir in the chopped sweet potatoes and add the ginger and pepper. Pour the chicken broth over it all and put it into the oven, covered, at 425F for about 25 minutes. 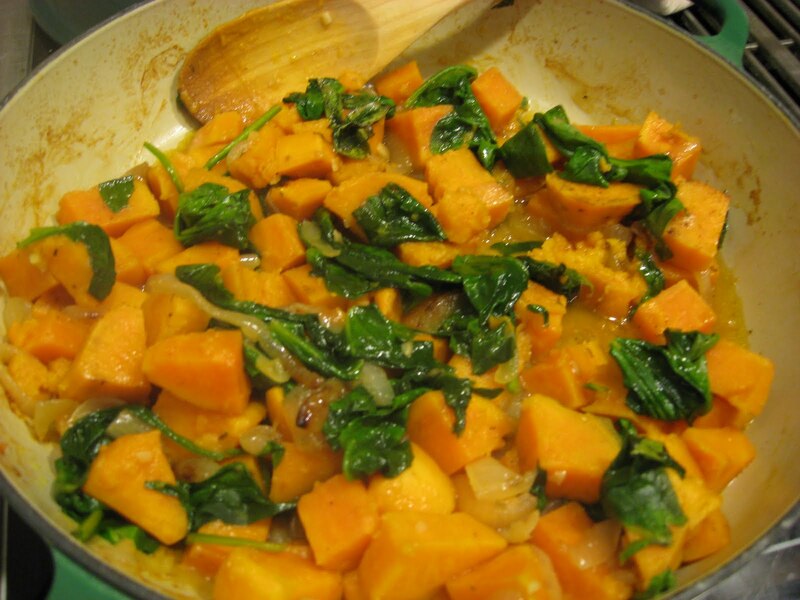 Check it after 20, because the cooking time varies depending how small you chopped the sweet potatoes. When you can stick a fork through the potatoes, stir in the spinach leaves and put it back in the oven for 5 more minutes (still covered). Delicious. A little overcooked (I had mine in over half an hour because I followed the cookbook and forgot to check early), so the sweet potatoes were falling apart, but I didn’t mind. Next time I make this, I’ll increase the spinach to make it greener – the garlic and ginger really make the spinach fabulous. This entry was posted in Uncategorized on April 12, 2011 by antijen.